Migrante New Jersey, formerly known as the Filipino Immigrants & Workers Organizing Project (FIWOP), aims to educate, organize and mobilize Filipino im/migrants and their families to protect and advance our rights. Filipino Immigrants and Workers Organizing Project urges City Council of Jersey City to support the campaign for Driver’s License for All. 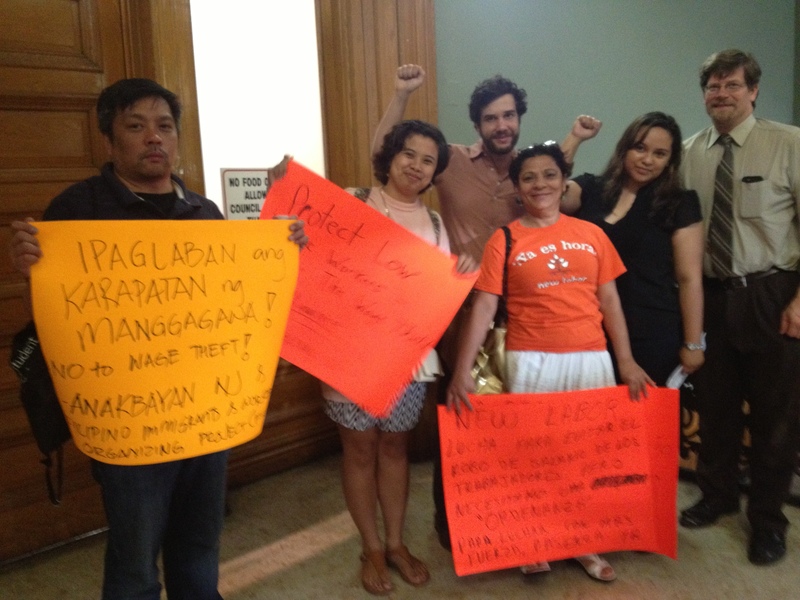 The Filipino Immigrant and Workers Organizing Project (FIWOP) joins the rest of the community in urging our City Council to pass the resolution for driver’s license for undocumented immigrants. This is an important issue in the Filipino community. Based on a survey conducted by FIWOP last April of this year, 9 out of 10 Filipinos in Jersey City agree with allowing undocumented immigrants the privilege to drive and be given driver’s licenses. This is most especially important to our Filipino workers who are employed in important industries here in New Jersey such as in the warehouse and distribution, healthcare and service industries. According to our constituents, taking public transportation would take them two to three hours to reach their workplaces as compared to 20 to 30 minutes by driving. This greatly reduces their productivity. New Jersey is home to the 5th largest concentration of Filipinos in the United States. There are 110,000 Filipinos living in the Garden State, with Jersey City having 15,000. 1 out of 6 Filipinos are undocumented Filipinos who simply aim to work decently and provide better opportunities for their families. With this, we call again on the City Council of Jersey City to be on the progressive side by joining the six other municipalities in New Jersey that have supported this cause. By supporting the campaign for driver’s license for undocumented immigrants, the City Council of Jersey City will be living up to its legacy as the Golden Door of America.